Andreas Mai leads innovation to deliver sustainable transportation solutions to public agencies and communities at Keolis North America. Before joining Keolis, Andreas led Cisco’s connected vehicle business and founded the technology startup ecomo.world. He is an angel investor and served on the boards of the Connected Vehicle Trade Association, the Connected Car Council, Octo Telematics, Cohda Wireless, and Covisint. During the 19th century—at the end of which Karl Benz built what many consider to be the first real automobile—mankind saw more technological and societal changes than it had in the preceding nine centuries. Fast forward to the current century, with futurist Ray Kurzweil (2006) confidently predicting that over the course of the next 100 years we’ll experience 20,000 years of progress, as rapid advances in technology stack up to drive unexpected exponential changes across technology domains, businesses and society. 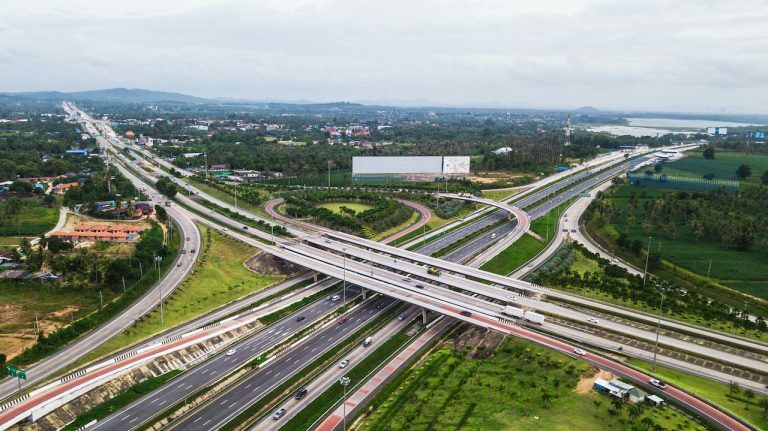 Nowhere is that progress more evident than in transportation, where the landscape is shifting at speeds that make a Formula One race look like a soapbox derby. Companies like Tesla, Google, Apple, Uber, Lyft and Didi, along with a head-spinning number of start-ups, are literally rewriting the rules of the road, creating massive disruptions in the automotive industry, public transportation, and society, while radically changing the way people live and work. As Kurzweil notes, exponential changes will increasingly call for exponential thinking and innovation. This is exactly what is happening to automakers today, as an industry that has historically worked in three- to five-year innovation cycles makes huge investments to try and keep pace with the avalanche of game changing innovations. Once-desired options like high-end sound systems and on-board navigation have given way to technologies that enable vehicles to communicate with each other and the Internet, and with intelligent transportation infrastructures. Advanced driver assistance systems and, ultimately, self-driving technology, along with the ability to order a (shared) vehicle when and where needed on-demand rather than owning a vehicle are changing significantly what automotive customers want and how they want it. But probably the most fundamental change to the major automakers’ current business model is that their most important customers may no longer be consumers, but megacities—cities with 10 million plus people, where roughly 70 percent of humanity is expected to live by 2025. Today, most large cities rely on large, complex, publicly-funded systems to meet the transportation needs of their citizenry. But even as many millennials reject long commutes to distant suburbs in favor of a more urbanized and sustainable lifestyle, they are drawn to technology-driven products and services that provide them with all the conveniences of a car, but with the freedom of not having to find a parking space. In an ideal world, public transit authorities would be able to provide their patrons with a fully integrated system that efficiently leverages all modes and tools of transit—from commuter and light rail, to buses, taxis, and bicycles—along with new technologies like on-demand services for (self-driven) personal vehicles, fun modes like bicycles, and connected parking spaces. In such systems, public and personal modes are designed to complement each other and are effectively managed to create the most efficient, economical, and sustainable flow of people. Of course, the reality is much different. 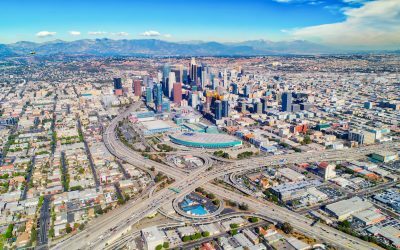 Many city transportation systems are in a decrepit state, operating at a financial deficit, which is further exacerbated by agencies that operate in silos and with duplicate overheads. 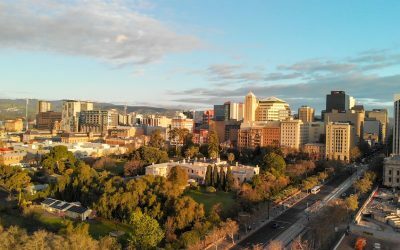 Cities are under increasing pressure to innovate in order to attract businesses and people, and remain economically strong, and their success or failure could largely depend on their future transportation systems. Transportation systems are like arteries. When running smoothly, a community is likely to thrive and prosper. System breakdowns and blockages lead to quality of life issues such as traffic jams and pollution—problems that can quickly put an economically vibrant community into cardiac arrest. But while providing consumers with convenient options, the popularity of these new mobility services bring their own set of issues, and have the potential to put even more pressure on already highly stressed transportation systems. Uber and Lyft, for example, are putting more cars on already congested roads. In New York City, it is estimated that these services account for a 14 percent increase in the number of vehicles on the street. 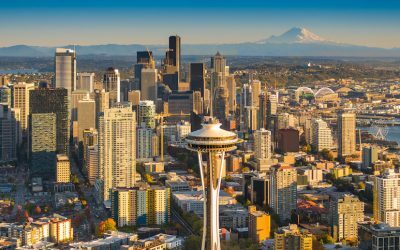 These new services take market share from traditional taxis, car rental services, and public transit, creating new market pressures and policy issues. New entrants into the market will naturally focus on more profitable areas and routes, leaving unprofitable ones to public transit authorities. 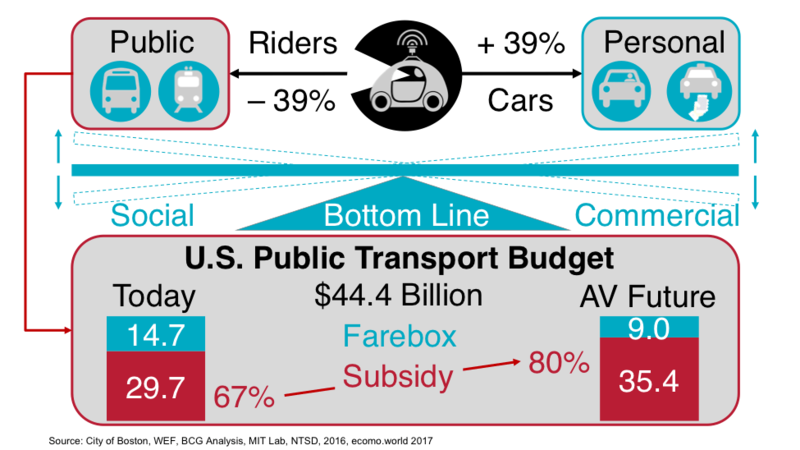 Simulations of the impact of self-driven (shared) taxis and shuttles for the city of Boston (BCG and MIT for the World Economic Forum, 2017) concluded that such services have the potential to reduce public transit ridership by 14 to 39 percent, and increase subsidies from currently 67 percent to 80 percent of the cost to provide public transportation to over 100 Million people in the United States. That’s not good news for an aging transit system that’s already facing a significant funding deficit, and even worse news for congestion on our roads. 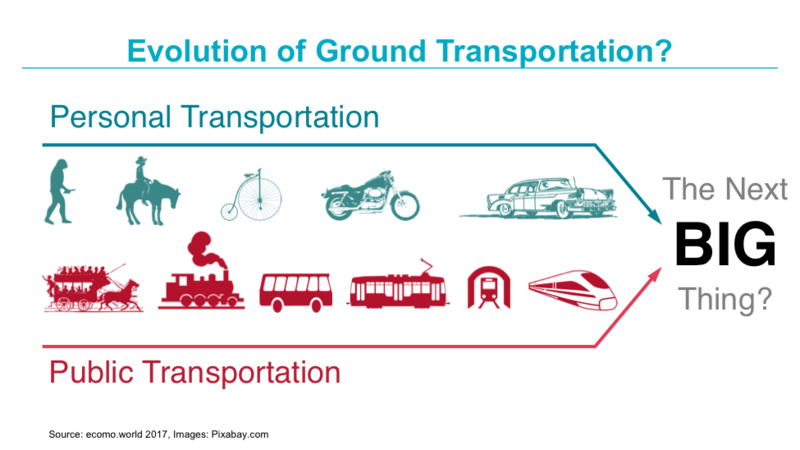 Balance the commercial and social bottom-line of public and new personal mobility modes. Efficiently balance supply and demand across all systems. Deliver integrated multi-modal transportation services. 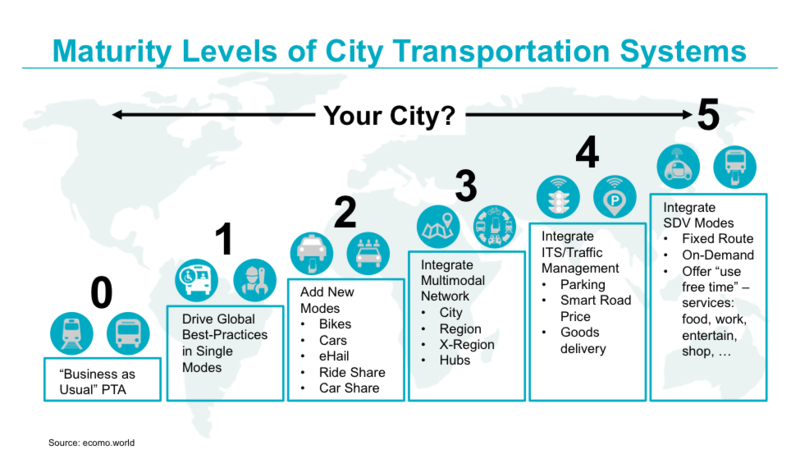 In an increasingly global competition for the best people and businesses, cities will have to assess the maturity of their current transportation system and determine how far they are willing and able to push the envelope to provide economically viable and sustainable transportation systems to their citizens. Should cities make data sharing a cost of doing business for private transportation companies? Should taxis and e-hailing operators be taxed at a higher rate for trips with underutilized four to six passenger vehicles? How can cities ensure that automakers or mobility as a service startups operate reliable and safe (self-driven) taxis? What type of vehicles should a city authorize for future personal transportation services, e.g., electric, self-driven, traditional vehicles, ultra-small vehicles, etc.? Should a city dedicate a section of a city or a segment of a road exclusively to self-driven vehicles to accelerate deployment? Should cities outsource the entire operation of multi-modal transportation systems or manage it in existing or new agencies? Should cities outsource their transit services to well-known public transport operators or consider new entrants into the industry, such as automakers or startups? Should cities work exclusively with one automaker or one mobility as a service startup for (self-driven) personal vehicle modes? How can cities ensure there will be an array of choices of personal vehicle brands and personal transportation services? And last, but certainly not least, will automakers and public transit authorities be able to make the leap of faith to align traditionally opposing objectives to create a joint solution that is better than its individual parts? This is just the tip of the iceberg. There are many more questions for which future city transportation managers and strategists of new private entrants in the converging personal and public transportation market will need to find good answers. The many uncertainties and the complexity of this challenge will require new forms of collaboration between currently stove-piped government entities and across currently disjointed industries. Even more importantly, we will need strong, visionary leaders capable of driving us to a bright future of smart city transportation. We are going towards the comfortness. 1. Providing comfortable solutions to the community. 2. Helping in saving peoples time. 3. Enhancing the quality of life. but, comfortness also leads to many issues like: health problems, change of behaviour of peoples, etc. 3. Increasing chances of accidents. 5. Problems for walkers, etc. Govt. always comes with smart and sustain solutions like, BRTS, MRTS,.. to take control over traffic jams and accidents. A bus can accomodate approx 40-60 persons, wheather a car can only accomodate 4 peoples, Which means bus accomodating 10-15 times seating space than a car. It means a lot. Also, it helps in generating economy for the city development and provide employment to the peoples And there will be less pollution and it is cheaper also. Yeah, this is right travelling in bus can be hectic but its not a major factor. Problem is our community who do not wants to take bus to rather than taking a cab to reach one place to another just because of comfort. so, whatever the solutions will come in future, when the peoples are not come to use the public transport then there will be rise in many problems. And, widening the roads and construction of flyovers is not a long term sustain solution.